Because conventional light oil can typically be produced at a high rate and a low cost, it has been used before other types of oil. Thus, conventional oil accounts for a declining share of the Earth's remaining oil endowment. In addition to assessing conventional oil resources, scientists of the U.S. Geological Survey's Energy Resources Program collect data on the abundant energy resources available as heavy oil (including extra-heavy oil) and natural bitumen; see definitions in sidebar. The data in this Fact Sheet are compiled from commercial databases (NRG Associates, I.H.S. Petroconsultants), unpublished government data, and the published literature. Natural bitumen (often called tar sands or oil sands) and heavy oil differ from light oils by their high viscosity (resistance to flow) at reservoir temperatures, high density (low API gravity), and significant contents of nitrogen, oxygen, and sulfur compounds and heavy-metal contaminants. They resemble the residuum from the refining of light oil. Most heavy oil is found at the margins of geologic basins and is thought to be the residue of formerly light oil that has lost its light-molecular-weight components through degradation by bacteria, water-washing, and evaporation. The estimated volume of technically recoverable heavy oil (434 billion barrels) and natural bitumen (651 billion barrels) in known accumulations is about equal to the Earth's remaining conventional (light) oil reserves (table 1, fig. 1). 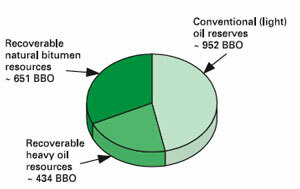 heavy oil and natural bitumen in billions of barrels (BBO). Russia but is either in small deposits or in remote areas in eastern Siberia. Figure 1. Distribution of the world's known recoverable oil resources and reserves by type. Technically recoverable oil in known heavy oil and natural bitumen accumulations is about equal to reserves of light oil (API gravity greater than 22°) in known conventional accumulations. BBO, billion barrels of oil. In spite of an immense resource base, heavy oil and natural bitumen accounted for only about 3 billion barrels of the 25 billion barrels of crude oil produced in 2000. Compared to light oil, these resources are generally more costly to produce and transport. Also, extra-heavy oil and natural bitumen must usually be upgraded by reducing their carbon content or adding hydrogen before they can be used as feedstock for a conventional refinery. The extra production, transportation, and upgrading costs explain why development and production of extra-heavy oil and bitumen are still limited. Their abundance, strategic geographic distribution, quality, and costs will shape their role in the future oil supply. Light oil, also called conventional oil, has an API gravity of at least 22° and a viscosity less than 100 centipoise (cP). Heavy oil is an asphaltic, dense (low API gravity), and viscous oil that is chemically characterized by its content of asphaltenes (very large molecules incorporating most of the sulfur and perhaps 90 percent of the metals in the oil). Although variously defined, the upper limit for heavy oil has been set at 22° API gravity and a viscosity of 100 cP. Extra-heavy oil is that portion of heavy oil having an API gravity of less than 10°. Natural bitumen, also called tar sands or oil sands, shares the attributes of heavy oil but is yet more dense and viscous. Natural bitumen is oil having a viscosity greater than 10,000 cP. Viscosity is a measure of the fluid's resistance to flow. It varies greatly with temperature. Viscosity matters to producers because the oil's viscosity at reservoir temperature determines how easily oil flows to the well for extraction. Density is a measure of mass per unit volume and interests refiners because it is an indicator of yield from distillation. Oil density is expressed in degrees of API gravity, a standard of the American Petroleum Institute. API gravity is computed as (141.5/sp g) - 131.5, where sp g is the specific gravity of the oil at 60°F. The Western Hemisphere has 69 percent of the world's technically recoverable heavy oil and 82 percent of the technically recoverable natural bitumen. In contrast, the Eastern Hemisphere has about 85 percent of the world's light oil reserves. Heavy oil and natural bitumen are present worldwide (table 1). Each category is dominated by a single extraordinary accumulation. The largest extra-heavy oil accumulation is the Venezuelan Orinoco heavy-oil belt, which contains 90 percent of the world's extra-heavy oil when measured on an in-place basis. Eighty-one percent of the world's known recoverable bitumen is in the Alberta, Canada, accumulation. Together the two deposits contain about 3,600 billion barrels of oil in place. In addition to extra-heavy Orinoco oil, South America has an estimated 40 billion barrels of technically recoverable heavy oil, so that, in total, 61 percent of the known technically recoverable heavy oil is in South America. Of the 35 billion barrels of heavy oil estimated to be technically recoverable in North America, about 7.7 billion barrels are assigned to known producing accumulations in the lower 48 States, and 7 billion barrels are assigned to the North Slope of Alaska. The U.S. bitumen accumulations are largely in Utah. No U.S. accumulations are being produced commercially, although, in total, they are estimated to contain 6.1 billion barrels of recoverable bitumen. Currently, producers target heavy oil accumulations having better quality oil in terms of chemistry and density. 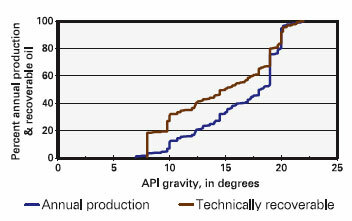 About 66 percent of the heavy oil produced annually is lighter than 15° API gravity, but about 50 percent of the estimated technically recoverable heavy oil is denser (less than 15° API gravity) (fig. 2). Figure 2. Cumulative percentage of annual production (blue) and cumulative percentage of technically recoverable resources (brown) of heavy oil as a function of oil density (API gravity) in 2000. Less than 10 percent of the heavy oil produced annually is extra-heavy oil (API gravity of 10° or less), whereas 33 percent of the technically recoverable heavy oil has an API gravity of 10° or less. In conventional production, reservoir pressure from gas and water associated with the oil is generally sufficient to cause light oil to flow to a production well. If natural reservoir pressure becomes depleted, then oil flow may be enhanced by injecting gas or water into the reservoir to push the residual oil to the production well. Historically, heavy oil was found incidentally during the search for light oil and was produced by conventional methods when economically feasible. However, to sustain commercial well production rates, heavy and extra-heavy oil production almost always requires measures to reduce oil viscosity and to introduce energy into the reservoir. When super-heated steam is injected into a reservoir, oil viscosity is reduced and reservoir pressure is increased through displacement and partial distillation of the oil. Steam may be injected continuously to form a flood or it may be injected in cycles so wells are used alternately for injection and production. Extra-heavy oil commonly requires the addition of diluents (gas condensate, natural gas liquids, or light crude) to enable the oil to be transported by pipeline. Extra-heavy oil must also be chemically upgraded to reduce density and remove contaminants before it can be used as refinery feedstock. In recent projects in the Venezuelan Orinoco heavy oil belt, 1 barrel of diluents is required for every 3 or 4 barrels of extra-heavy oil produced. Natural bitumen is so viscous that it is immobile in the reservoir. For oil sand deposits less than 225 feet deep, bitumen is recovered by mining the sands, then separating the bitumen from the reservoir rock by processing it with hot waters, and finally upgrading the natural bitumen onsite to a synthetic crude oil. 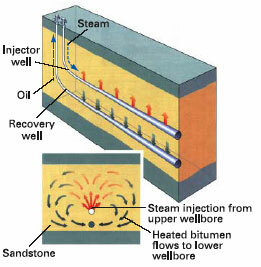 In deeper oil sand deposits, where the bitumen is commonly less viscous, steam is injected into the reservoir to mobilize the oil for recovery by production wells. The product may be upgraded onsite or mixed with diluent and transported to an upgrading facility. In the Orinoco heavy oil belt, horizontal wells and lateral branches that are optimally positioned and equipped with improved electrical submersible or progressing cavity pumps can deliver up to 2,000 barrels of oil per day. Such horizontal well costs have been reduced in recent years, and thus this extra-heavy crude oil is commercial. However, the costs associated with the diluents for reservoir injection and for facilitating transport to an upgrading facility are still significant. Concession operators plan to increase Orinoco production to 600,000 barrels of extra-heavy oil per day by 2005 and to sustain that rate for 35 years (Petroleum Review, 2001, v. 55, no. 653, p. 30). Natural bitumen is extracted from Alberta oil sand deposits that are too deep to surface mine by a process known as steam-assisted gravity drainage (SAGD); see fig. 3. Production wells could produce in excess of 2,000 barrels of bitumen per day. In 2001, about 735,000 barrels per day were extracted by mining and by in-situ production from Alberta oil sands, accounting for 36 percent of Canada's total oil production. Projected 2011 production is 2.2 million barrels per day (Alberta Energy and Utility Board, 2002, Alberta's Reserves 2001 and Supply/Demand Outlook 2002-2011, Statistical Series 2002-98, p. 2-8 to 2-9). Figure 3. Stacked pair of horizontal wells for steam-assisted gravity drainage (SAGD), a natural bitumen recovery process. Steam injected through the upper well mobilizes bitumen, and gravity causes the mobilized fluid to move toward the lower well, where the bitumen is pumped to the surface. Graphic copyright Schlumberger "Oilfield Review"; used with permission. From Carl Curtis and others, 2002, Oilfield Review, v. 14, no. 3, p. 50.